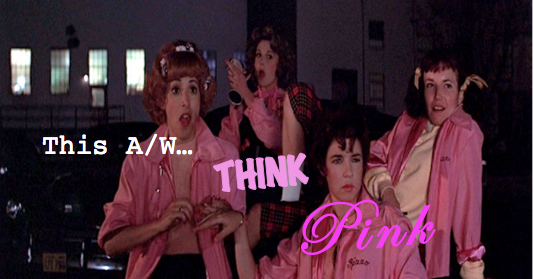 The motto I've adopted for my A/W winter wardrobe this year will be "Think Pink". Gone are the days of Mean Girls restricting themselves to only wearing pink on Wednesdays. The ladylike hue is set to be one of the biggest (and my personal fave) trend of this Autumn/Winter '13. Pink lovers can rejoice as the trend has creeped its way into highstreet hotspots Topshop, Penneys & ASOS, to name but a few with the colour making quite the impression on the catwalks of Mulberry, Carven & Topshop Unique this year. My childhood dream to overdose in head-to-toe pink like Rizzo & the gang (...the Pink Ladies from Grease, for those who have been living under a rock) is now acceptable in the ~fashion world~. Happy? Indeed. These are just a handful of my top picks that demonstrate the trend perfectly, and you may notice are predominantly from Topshop, who are absolutely acing it atm but unfortunately draining my bank account. My fave piece is the pale pink vinyl pencil skirt. I actually have it and oh my god, did it take what feels like forever to get my hands on this coveted gem. I wore it to my 21st birthday last week and being honest I felt like I was transported back into the sixties in this sweet baby pink number. It certainly gave my outfit a unique but girly twist and the hurdle to get it was certainly worth it. The great thing about this trend is there are so many different shades of pink from pale, dusky pinks to bold, bubblegum pinks. On top of that there is an abundance of textures you can mix and match like fur, vinyl, knit, jersey etc etc. We're spoilt for choice with this trend and I am definitely gonna be lapping it up this autumn/winter. What pink pieces are you lusting after?